Indeed, He is like a potter. He molds us into something that He wants us to be. Like a potter, it takes too much effort for Him to bring out the best in us. The best thing that we should do is to always obey, follow His commands and ensure that we are doing the right thing in our every ways. 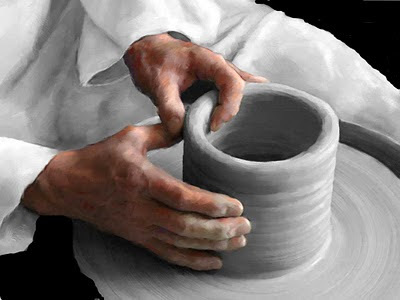 In real life, when the potter saw the output as unsatisfactory, he destroys it and remold it, rebuild it and reshape it. Like in our lives, sometimes we fail Him by doing sins and not following His path. But He is a forgiving God that He always forgive us so that we can have a fresh start. But this doesn't mean that we shall abuse it as every actions has it's own consequences. To be a righteous person, the road towards to His way will be full of trials and obstacles which will help us to be molded perfectly. It just like how the real potter put his finished product in the realm of fire to finish it perfectly and be the best piece of art. We should always remember that He is the potter and we are the clay. On the above verse, 10 men were healed from leprosy but only one came back to give thanks to Him. Sometimes when we have a blessing we forgot to thank Him. We should always remember that everything comes from Him. Also, there is a time that we are looking on the negative thing, why don't we focus on what we have and what is presently being provided to us. A simple thanks to Him will be sufficient. It signifies that we remember Him not only during our sad moments. I sometimes say, "Thanks Lord ah!" or a prayer of gratitude during a quiet moment. "Thank you", simple words but means a lot to Him, we are remided to be grateful to Him.